The Tin Room Bar and Grill in Burien is more than just a place to grab lunch. It’s a central part of Olde Town Burien and it’s packed with history. Never in a million years did I think I’d find myself in Burien five days a week, but with my new office located a few blocks away, I’ve enjoyed the food at this family-owned restaurant more than a few times now. The chicken sandwich at the Tin Room Bar and Grill. The food at the Tin Room Bar and Grill in Burien (923 SW 152nd St.) does not disappoint. While the menu may look a little simple– with lots of sandwiches, salads and soups– it is all incredibly fresh and tasty. I can’t get enough of their chicken sandwich. It comes with caramelized onions, Swiss cheese, tomato and lettuce. My favorite part of the sandwich is the mustard called Dan’s Mustard. It has a kick to it and I find myself craving it. 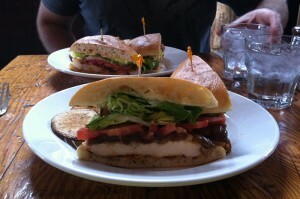 When Tim and I went, he dove into the grilled shrimp and bacon club and he enjoyed it. I’ve also heard great things about their fish tacos and salads. The french fries are awesome at the Tin Room Bar and Grill. If you take a look at the picture above, you see that they cut the potatoes into circles. The circular fries come out piping hot when they arrive at your table and they are seasoned just right. On top of the fries, I also recommend the Tin Room’s dessert. Tim and I split their homemade Key lime pie and it was delicious! Since I’ve only dined at the Tin Room Bar and Grill during lunch, I haven’t tried any of their specialty cocktails. The drink menu looks intriguing and they have fresh fruit lining the bar, so I’ll have to make an evening stop soon. 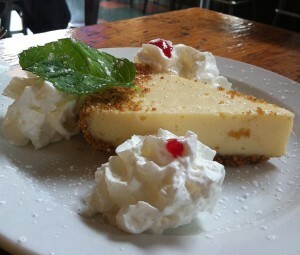 Key Lime Pie at the Tin Room Bar and Grill. Like I mentioned, there is a lot of history at the Tin Room Bar and Grill in Burien. Before the restaurant opened up shop, the building was home to Ernie Eder’s Hi-Line Tin Shop. To pay tribute to its history, the owners kept “tin” in the name. There is also plenty of tin and exposed wood used to decorate the restaurant. The tables are made from benches in the old tin shop and some of Ernie’s old tools are now hanging on the walls. There are also a lot of old newspaper articles on display. The owners have done a nice job to modernize the place while still incorporating fun, vintage elements. The Tin Room Bar and Grill is located in a two block area of Burien called Old Town Burien. The small neighborhood is packed with restaurants and boutiques. It is a fun place to stroll. All of the small business owners are passionate about the community and the people they serve. I’m looking forward to exploring the area a little bit more in the future. One final thing to note about the Tin Room Bar and Grill in Burien is that there is an old school movie theater attached to the restaurant called the Tin Theater. Owned by the same family, the theater shows one movie every night. The movie changes once a week and moviegoers can enjoy food and drinks while watching the flick. It is also a 21-and-older movie theater. Tim and I haven’t caught a movie at the theater yet, but we plan to do so soon! Have you ever eaten at the Tin Room Bar and Grill in Burien? What did you think? We’d love to hear from you! Please leave a comment below or connect with us onFacebook, Twitter and Google+. Don’t forget to also check out Seattle Bloggers for more great places to eat and drink around the Puget Sound and Seattle!